About 2 weeks ago, Peter & I travelled to Amsterdam-Oost in The Netherlands. I talked about Rum Baba, The Tropenmuseum & Bar Basquiat! Now, I am going to talk about a lovely restaurant were we had a nice delicious dinner in East 57! 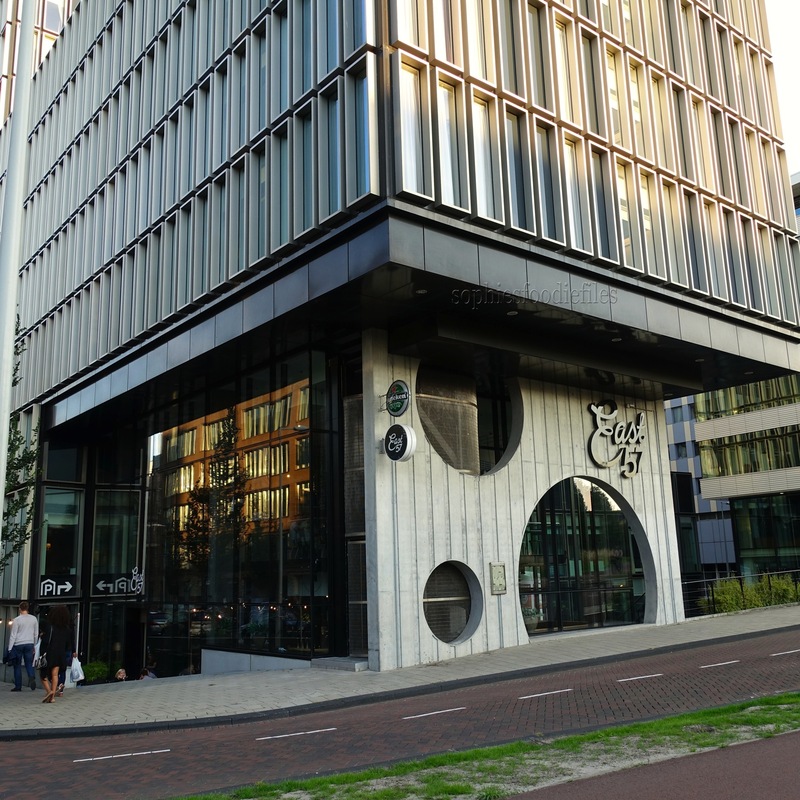 It is situated, nearby the Transvaalkade in Amsterdam-Oost! After 20-25 minutes of walking we ended at the restaurant. East 57 includes a modern restaurant, a wine bar, a coffee shop and a deli. 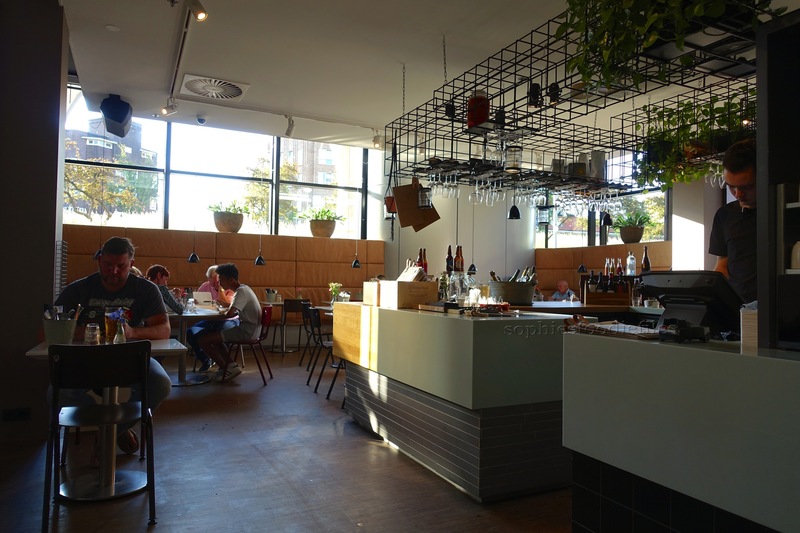 East 57 offers different sorts of soups, salads, sandwiches/burgers, platters and meat and cheese dishes made from fresh ingredients.The restaurant menu has lots of other local delicacies sourced from Amsterdam and its regions. 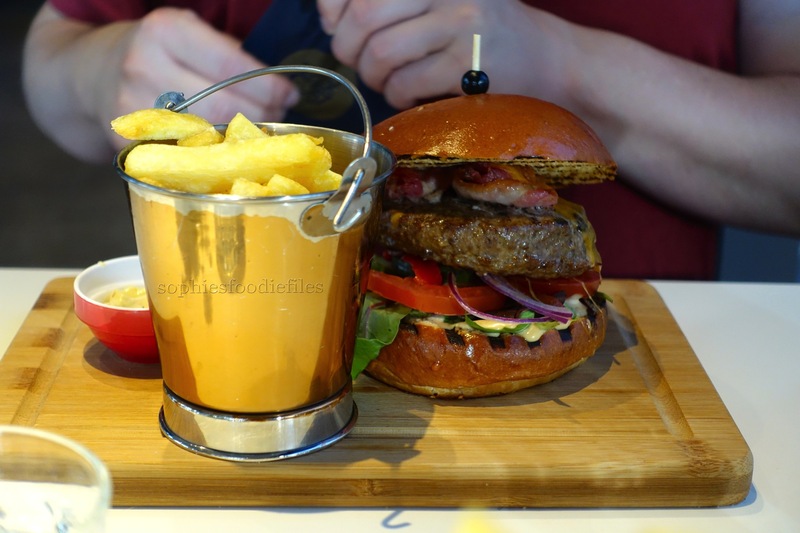 Peter took this lovely East 57 burger: a Black Angus beef burger with paprika onions, lettuce, bacon, Cheddar cheese & a home-made sauce. This was also served with yummy fries & a mustard-mayo. Super yummy juicy burger & the works! it costed 16,95 Euro. MMMMM! 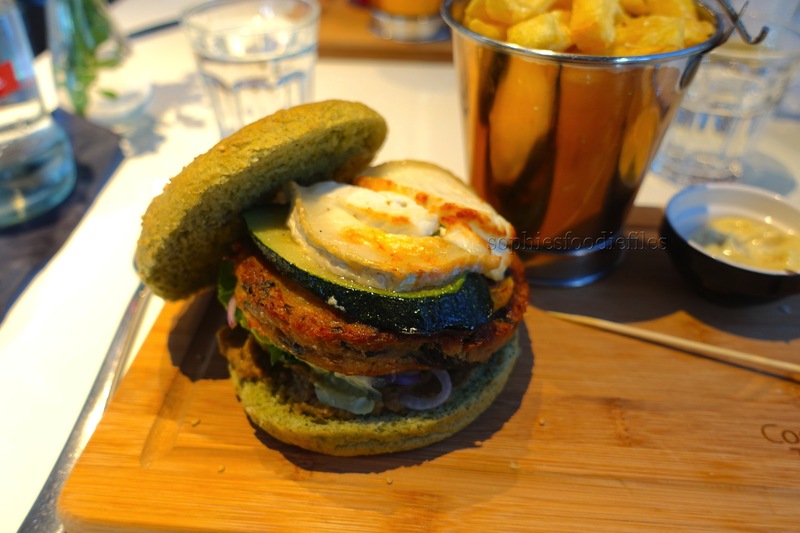 I took the vegetarian Dutch Weed Burger! No, no, not weed aka drugs but Seaweed! Ha! It costed also 16,95 Euro. 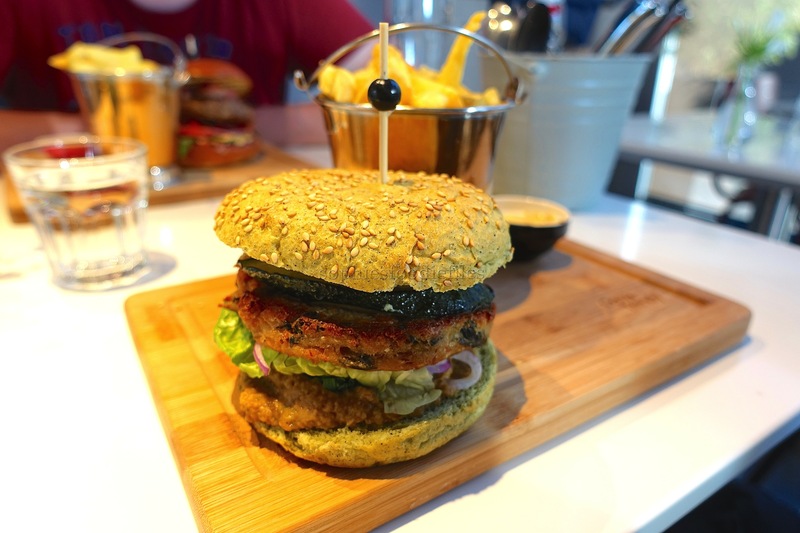 Two grilled sewed buns, that is why, they are green with a burger of seaweed & soy meat, baba ganoush, a slice of goat’s cheese, grilled green courgette & a weed sauce, also served with crispy fries & a home-made mustard-mayo! Delicious! The portions & sizes of the burgers were huge & that is why, there was no room in our bellies for dessert!!! Peter took a white & tea & I took an Earl-Grey tea. We drank a bottle of sparkling water & Peter a white beer from the local brewery het IJ. The check was nearly 50 Euro. We will come back! 🙂 Then we walked back via the Transvaalkade to our car park & went home. East 57, Eerste Ringdijkstraat 4, 1097 BC Amsterdam-Oost. You can also find my review of East 57 here on Google maps! The Tropenmuseum & Bar Basquiat! Previous Post Vegan Gluten-Free Spiced Chestnut Pancakes! Next Post Stuffed Yellow Courgettes served with simple fresh tomato slices! Looks like you had a wonderful meal. So fun to see your travels Sophie!! These do looks like fantastic burgers– great details descriptions. You had me wishing they were here on our plates! thanks! Your burgers look amazing, Sophie. I loved mine a lot & so did Peter! But he is a real meat eater! I love your recent travelog posts a lot, dear Sophie! What huge burgers! That resto looks cool too!